See what I did with that title there? SILK is the super wideband audio technology that comes built in to the latest versions of Skype (Windows 4.1 / Mac 2.8) and offers much improved stereo audio call quality. 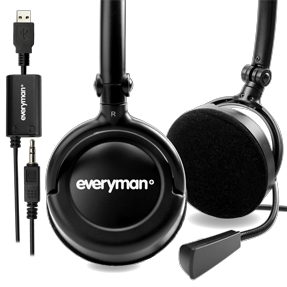 The Freetalk Everyman headset only costs around £19 ($30) and not only offers quality calls but comes with a converter plug that lets you listen to music on your portable music player as well as plug in to your PC via USB. The neodymium speakers offer a decent enough 20Hz-20kHz frequency range, while the built in unidirectional microphone helps to eliminate background noises. They sure have taken some shortcuts on this one. Feels very cheap and vital things are taken out of it. There is no volume control or mute button, for example. If someone screams in my ear I have to fiddle with the software in order to lower or mute the volume: I might get deaf in the process. That’s a great shame, particularly given how much Skype seems to be promoting the headset now (keeps appearing on the home page). Sorry, guys, but if I were going back to a wired headset, I’d have to choose the trusty Logitech Premium Notebook Headset. On sale, you can pick it up sometimes for $40 at Best Buy. It has all of the features listed in the model above, plus in-line volume and mute, comfortable, secure behind-the-neck fit (no more headset hair days), sliders to adjust the speakers individually from the frame for comfort, a sturdy carrying case, and mine lasted almost 3 years before it fell apart. And I used it heavily. I’ve never seen anything from competitors, Plantronics included, that was that well engineered for this purpose. It was a constant companion in my laptop bag.